To mark the 100th anniversary of baseball legend Jackie Robinson’s birthday, the Museum of the City of New York is bringing visitors inside the Dodger’s dugout. In the Dugout with Jackie Robinson: An Intimate Portrait of a Baseball Legend takes visitors through Robinson’s ground breaking career as the first African American to play in major league baseball, starting from his days as rookie on the beloved Brooklyn Dodgers team in 1945 to his retirement in 1957, through unpublished photographs from the museum’s permanent Look magazine collection, sports memorabilia, and rare home videos. In the Dugout explores Robinson’s life as a famous figure both on and off the field, showcasing not only his athletic prowess, but also his accomplishments as a businessman, a loving husband and father, and an American icon. Through the thirty rarely and some never-before-seen photographs in the exhibit, Sean Corcoran the museum’s Curator of Prints and Photographs, hopes that visitors will get a sense of the closeness Robinson shared with his teammates and family, in addition to an appreciation of Robinson’s struggles and triumphs over the challenges he faced on the field due to his race. 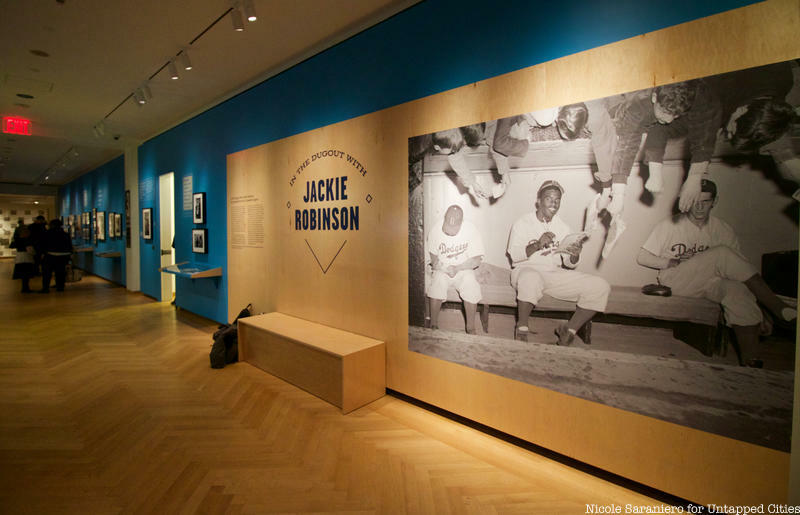 Images in the exhibit show Robinson getting thrown at, running the bases, talking to teammates in the clubhouse, sitting in the dugout and playing around with his children. Among the intimate photographs visitors will also find historic pieces of sports memorabilia including Robinson’s left handed practice glove, a baseball signed by the 1952 Dodgers team, and a Brooklyn Dodgers pennant from 1953. Also featured in the exhibit are various publications written by and about Robinson. Robinson wrote multiple autobiographical articles for Look magazine starting in 1955 and he even used the magazine to announce his retirement in 1957. After a ten year career with the Brooklyn Dodgers, during which he won the inaugural Rookie of the Year Award, the National League MVP Award, and helped the team secure its only World Series victory, Robinson retired from baseball and took a vice president position at Chock Full O’Nuts, a major coffee company. The exhibit has his 1956 contract, which made him the first African American vice president of a major American corporation. In the Dugout, which was created in partnership with the Jackie Robinson Foundation, opens on Thursday, January 31st kicking off a year of centennial celebrations leading up to the opening of New York City’s Jackie Robinson Museum in December. The foundation will host a variety of celebratory events throughout the year including a concert, a traveling museum exhibit, and panel discussions. The Museum of the City of New York will also host a range of programming to accompany the exhibit which will run until May 31, 2019. You can find out more information about the exhibit’s supplemental programming here. You can purchase tickets to visit In the Dugout with Jackie Robinson online and check out photographs from out visit below. Will the Jackie Robinson exhibit be on at the end of June, beginning of July? If not, what will be on exhibit at that time?